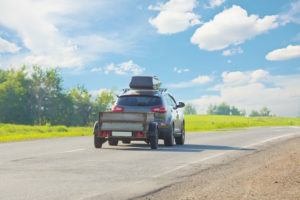 Learn how to stay safe on the road with these trailer towing safety tips. Driving comes with plenty of dangers. However, driving dangers become increasing more hazardous with the addition of a trailer. Whether you tow a camper, livestock, or recreational vehicles, it’s important to take extra safety precautions. Check out what you need to know about safe trailer practices so that you can ensure you stay safe on the road. When it comes to towing something, it’s imperative that you tow it properly to avoid any serious issues. Before you set off on the road, ensure that you read your car’s manual to check to see what sort of weight restrictions apply. That way you can adjust accordingly so that you can drive safely. When it comes to your trailer, weight distribution is important. As a general rule, the front of the trailer should be a bit heavier than the back of the trailer. Stick to the 60-40 rule so that you don’t encounter any issues while out and about. Before you leave on your journey, conduct a full inspection of both your vehicle and the trailer. That way if there are any issues, you can fix them before it’s too late. Check to see that all your tires are properly inflated, that the safety chains and hitch systems are all in good shape, and that your trailer fits all the established regulations. That way you can rest easy knowing that you’re ready to go. Be smart when it comes to safety. Brush up on all your trailer safety knowledge to avoid any roadside mishaps. For added protection get the coverage that you need with the right auto insurance. Contact the professionals at Robert J. Los Insurance Agency to find you the right insurance. Located in Hamburg, New York, we serve all your personal and commercial insurance needs.